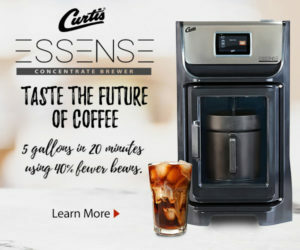 The new Curtis GemX brewer. Daily Coffee News photo. 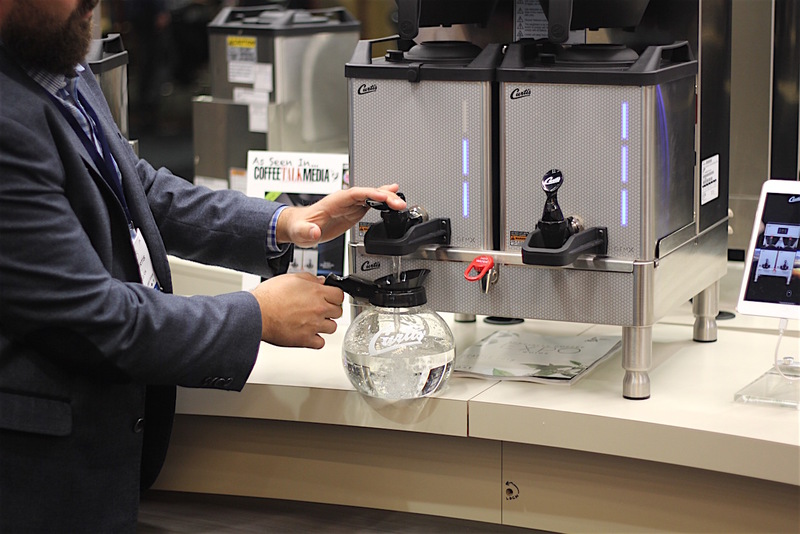 Commercial coffee equipment manufacturer Wilbur Curtis has unveiled the GemX line of batch coffee brewers, which represents the most significant refresh of the company’s Gemini brewer design since its debut roughly 40 years ago. 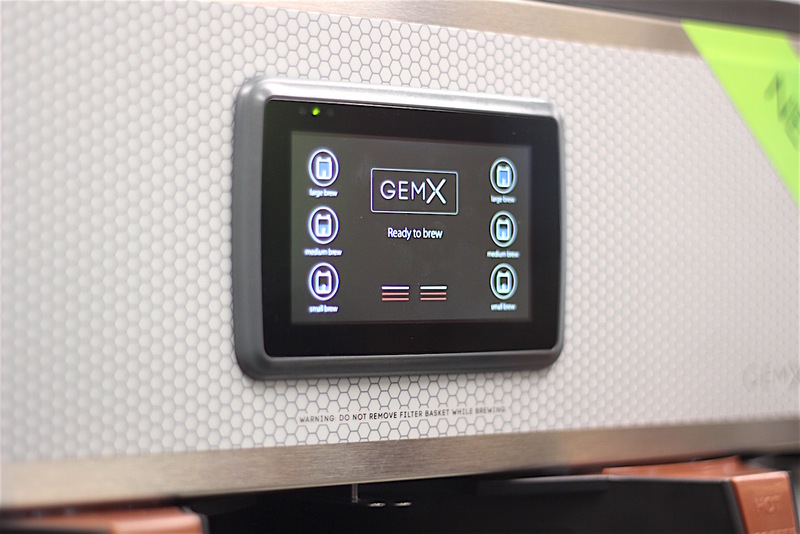 While maintaining the same countertop footprint, standards of efficiency and performance, and the familiar set of brewing features and settings found in the Gemini line, the GemX brings an updated and techier aesthetic. One of the new visual features is a cool multicolor LED system the company calls FreshTrac technology that allows workers in restaurant, retail and hospitality settings to determine volume and freshness of a satellite vessel’s contents from afar. Brant Curtis showing off the new GemX line. 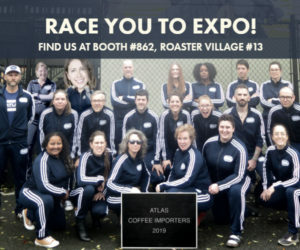 Daily Coffee News photo. Interior capacitive sensors detect volume and status on the inside, while on the outside, in place of the older model’s glass sight gauge, slim, vertically-oriented LED strips illuminate and flash in red, yellow, green or blue to signal various conditions. 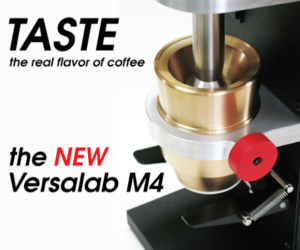 The sensors also interact with what the company calls “IntelliFresh” technology, through which GemX vessels maintain the temperature of hot coffee by applying brief, repeated pulses of heat intended to warm gently without cooking the SCA Golden Cup standard brew. The Curtis GemX G4 touchscreen interface. Daily Coffee News photo. 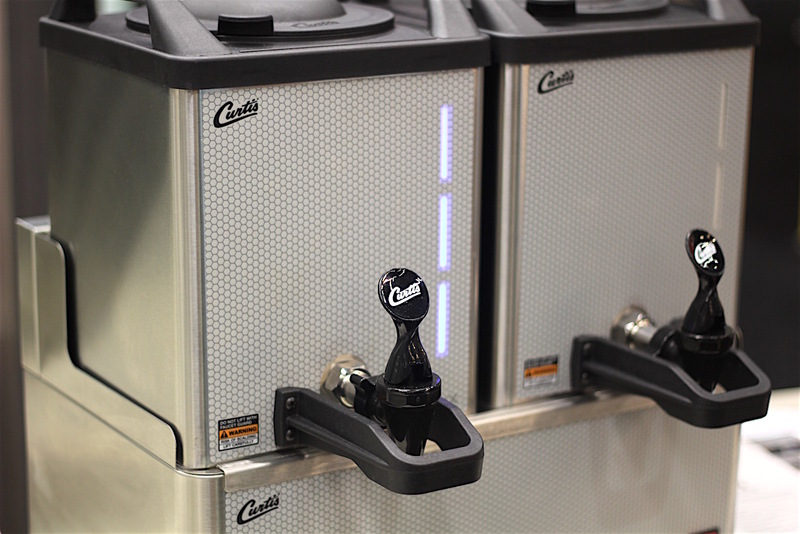 The Curtis G3 GemX interface consists of the small digital readout and membrane-style buttons familiar to users of the earlier models, while the G4 GemX includes a 4.3-inch touchscreen interface with icon-driven menus and the ability to program one-touch brewing operation. The G4 also offers a USB port for loading and retrieving program data and diagnostic info. 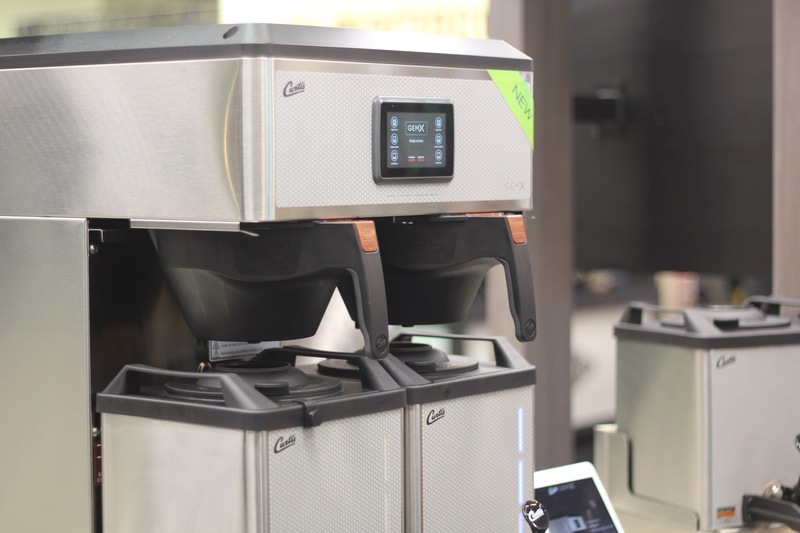 At the SCA Expo in Seattle this weekend, the company said that while the G4 does not yet offer any wireless or cloud-oriented features, it does have WiFi capabilities built in and ready for the next phase in the brewer’s development. GemX machines are built on the same chassis as the original Gemini line, allowing an easy replacement of a Gemini. Exterior surface skins are all customizable at the factory with companies’ names, logos and colors. 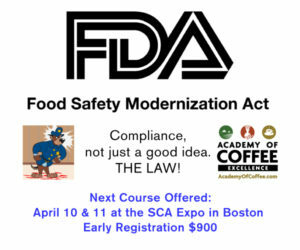 In addition to new rounded edges atop the system, other functional improvements to the satellite vessels include lockable lids, larger integrated handles, a more capacious square-shaped interior, optional pegs for hanging brew signs, and a sloping interior bottom design for more complete evacuation of the liquid. 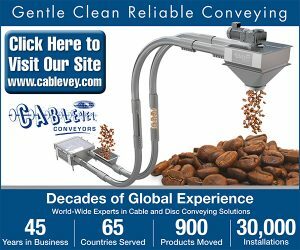 “We’ve made a large investment not just in the equipment itself but also in the manufacturing. 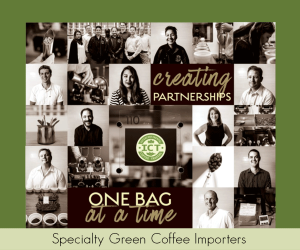 We created a whole new line for the launch of the product,” Senior Marketing Director Marc Heffner said of a 1,200-square-foot area in the company’s manufacturing plant dedicated entirely to the GemX, where production is currently underway. 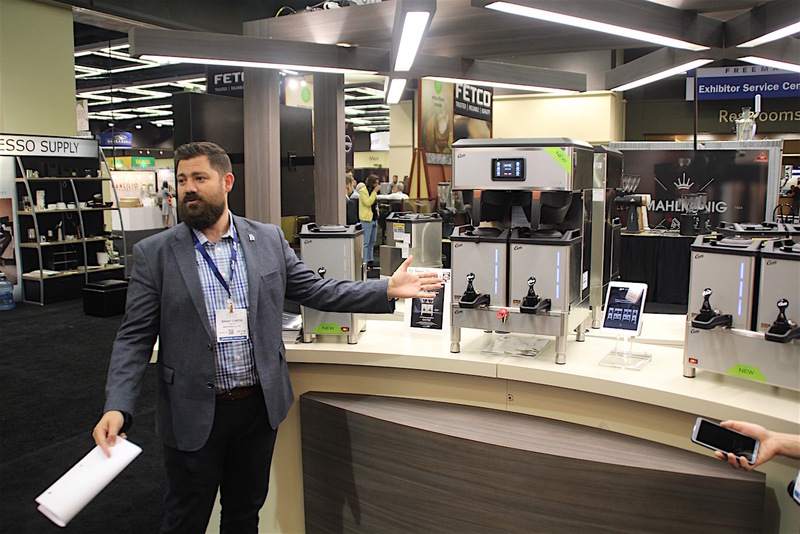 Wilbur Curtis began accepting orders for new machines this weekend and expects to start shipping GemX units the first week of May.